Department of Community and Economic Development (DCED) Secretary Dennis Davin toured the Human Resources Center’s (HRC’s) renovated supported living and employment facility for individuals with disabilities in Honesdale, Wayne County. HRC provides residential living options, supported employment, vocational rehabilitation, and day programs for adults with developmental disabilities in the Honesdale area. Also in attendance for the tour were HRC board members and executive staff, community leaders and Wayne County Commissioners Wendell Kay and Joe Adams. I was pleased to take the opportunity to meet with the northeast Pennsylvania chapter of the National Association of Insurance and Financial Advisors (NAIFA) at its annual legislative breakfast. I joined my House colleagues, Reps. Mike Carroll and Kyle Mullins, to listen to the group and provide them with answers to their various questions. This was a very worthwhile event and I would like to thank the members for their time and hospitality. I also want to especially thank my constituent and friend, Jeff Thol, for the invite. Last week's piece on the Barnes-Kasson tour showed an incorrect last name. The auto-correct spell check is not always a friend! I'm pictured below with David Passetti, Kelli Kane, Sara Adornato, me and dear friend Charlie Aliano. Start planning for this year’s fishing season with the PA Fish and Boat Commission’s 2019 Trout Stocking Schedule. More than 700 streams and 120 lakes will be stocked with nearly 3.2 million adult trout in Pennsylvania rivers and streams that are open to the public for fishing. About 53 percent of the trout are stocked prior to opening day, 43 percent are stocked between opening day and the end of May, and the remaining 4 percent are stocked from October through February of the following year. Opening Day of trout season will be Saturday, March 30, for Pennsylvania’s southeastern counties. The rest of the state will open on Saturday, April 13. Copies of the trout stocking schedules, including a searchable database, can be found online at PFBC website or the PFBC’s “FishBoatPA” mobile app. A limited number of hard copies of the trout stocking schedules may also be obtained at my district offices. House Republicans have been, and will continue to be, leaders when it comes to education funding, having increased funding for PreK-12 education by $3.4 billion since 2011. The budget process continues next week with the first in a series of House Appropriations Committee hearings to delve into the details of the governor’s plan. For a schedule and live streaming of the hearings, visit pahousegop.com. 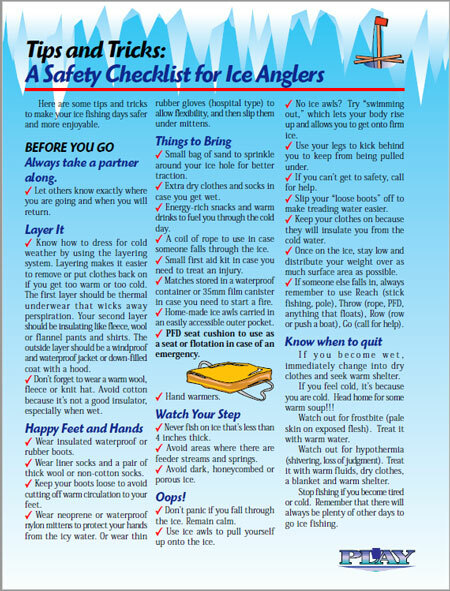 • Always wear a lifejacket or float coat while on the ice. Avoid inflatable lifejackets, which do not perform well in freezing temperatures. • When arriving at the water's edge, visually survey the ice. Look for open water areas and signs of recent changes in water levels. Ice sloping down from the bank can indicate a recent drop in water level, while wet areas on the ice can indicate a rise in water level. • Listen for loud cracks or booms coming from the ice. This can be an indicator of deteriorating ice. • Look for new ice, which is clear or has a blue tint. New ice is stronger than old ice, which can appear white or gray. • Remember that ice thickness is not consistent across the surface of the lake or pond. • Beware of ice around partially submerged objects such as trees, brush, embankments or structures. Ice will not form as quickly where water is shallow or where objects may absorb heat from sunlight. • Anglers should use an ice staff to probe ahead as they walk. If the ice staff punches through, retreat to shore slowly. • Always carry a pair of ice awls, which are handheld spikes. Ice awls can assist in performing a self-rescue, in which the spikes are driven into the ice to help someone pull themselves out of the water. • Never walk on ice that has formed over moving water such as a river or stream. • Never go out on ice alone. • Always let someone know your plans and when you expect to return. As the House begins its budgeting process for next year, including higher education funding, Pennsylvania families are saving more than ever to ensure their children can afford college or other post-secondary options. In 2018, Pennsylvania families set a record by saving over $585 million to use toward future education expenses in the PA 529 College and Career Savings Program. Through PA 529, families can choose from two plans. The PA 529 Guaranteed Savings Plan (GSP) allows families to save for post-secondary education at today’s rate, and the PA 529 Investment Plan (IP) allows families to choose how their contributions are invested from a list of 16 options. You can learn more about the 529 program at pa529.com or call 1-800-440-4000. House Republicans are continuing their commitment to ensuring the health and welfare of seniors and patients with chronic conditions by making it easier to adhere to their medication schedules. This week lawmakers passed House Bill 195, which ensures patients can synchronize their medications in order to receive refills on the same day each month, instead of having to make multiple visits to the pharmacy. This commonsense legislation would put Pennsylvania in line with Medicaid Part D, the PACE Program, and 35 other states that allow medication synchronization.